The Jeep Grand Cherokee SUV was updated last year. It's offered with gas or diesel power, and is also available in high-performance SRT form. Competitors include the Toyota 4Runner, Volkswagen Touareg and Land Rover Range Rover Sport. The upscale Summit model comes with illuminated door sills, a carpeted cargo mat, additional acoustic laminated glass and an active noise cancellation system. Argentina Tan leather upholstery with black stitching is also available, and a California Edition Appearance Package brings body-color and platinum chrome exterior trim along with 20-inch aluminum wheels to the Summit trim level. Jeep Grand Cherokee's 3.0L EcoDiesel V6 engine delivers clean-diesel technology with low CO2 emissions. The clean and refined powertrain delivers optimum efficiency with awe-inspiring performance. This model can attain up to 30 hwy mpg, drive up to 730 miles on one tank and tow up to 7,400 pounds to fulfill whatever your nomadic heart desires. The exceptional, new eight-speed automatic transmission provides better fuel economy, quicker acceleration and smoother shifting. It also allows for a 45% improved crawl ratio of 44.1:1 to aid in off-roading when equipped with a two-speed transfer case. The sophisticated Grand Cherokee features a more inviting and sumptuous interior with premium Natura Plus leather-trimmed heated seats with edge welting, refined suede-like premium headliner, exotic open-pore wood accents with unique copper trim or chrome trim accents. Jeep's commitment to excellence carries over to the leather-trimmed instrument panel door, center console and new shifter knob / armrest. An elegant and confident exterior design exudes strength from every angle. Every Grand Cherokee features premium styling treatments including new, modern front grille and fascia treatments, projector fog lamps, daytime running headlamps, and capless fuel fillers. 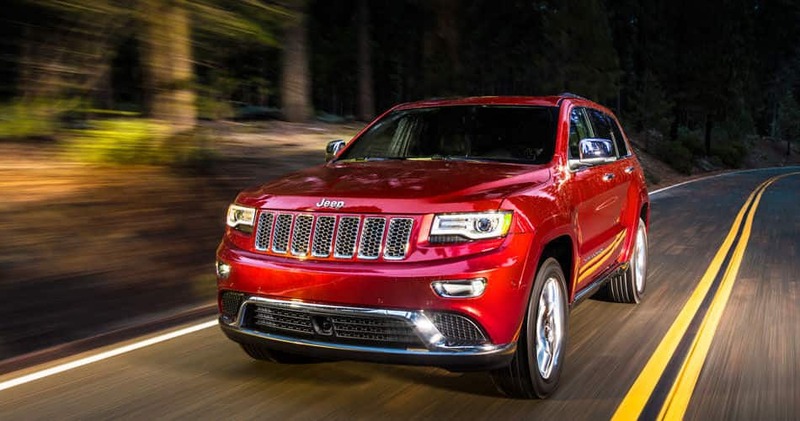 Required in every new Jeep Grand Cherokee are front airbags, antilock brakes and an electronic stability system. Also included are: Front-seat side-impact airbags, Side curtain airbags, Available forward collision warning, blind spot warning system with rear cross-path detection, backup camera, front and rear parking sensors and lane departure warning. For more information on this vehicle, feel free to give us a call!